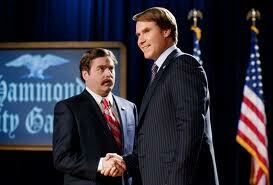 Zack Galifianakis and Will Farrell take politics to new lows in ‘The Campaign’. It isn’t brilliant satire, but Jay Roach’s The Campaign is an amusing and almost sadistic look at how low politics can go. Sadly, it arrives during the final stretch of perhaps one of the most acidic presidential campaigns in American history (and that’s saying a lot); as such, the movie is only slightly less ridiculous than the real thing. Will Farrell stars as incumbent Cam Brady, a blow-dried, blowhard five-term North Carolina congressman who has run unopposed in his district until the wealthy Motch Brothers (John Lithgow and Dan Aykroyd) abandon him and prop up unlikely and thoroughly unsuited local tour guide Marty Huggins (Zack Galifianakis). The brothers intend to effectively by the race in order to pave the way for an “insourcing” scheme involving the Chinese. The movie opens with a quotation from Ross Perot: “War has rules, mud-wrestling has rules — politics has no rules.” The Campaign takes this statement to heart, with its leads so hell-bent on one-upping one another and ready to win at all costs that nothing is off limits. Mud is slung, accusations are hurled, babies are punched, and wives are seduced. The jokes are often dumb, but then so are contemporary politics, and that’s the point. Farrell and Galifiniakis are cast well within their manchild-run-amok comfort zones here, and play off one another superbly. in a whirlwind of stupidity. Also adding to the mix are Jason Sudeikis as Cam’s veteran campaign manager, Dylan McDermott as Marty’s creepy PR consultant, and Brian Cox as Marty’s racist, Southern-fried father. Wolf Blitzer, Piers Morgan, and Chris Matthews manage to keep straight faces during their respective cameos, probably because they’ve seen worse behavior from politicians. It’s a very broad farce, but that is arguably what we need. Roach, who also directed Austin Powers and Meet the Fockers as well as the made-for-cable political flicks Game Change and Recount, plays it non-partisan here. Sure, Brady is cast as a Democrat and Huggins a Republican, but Roach is out for more than poking fun at ideology; politicians in general are his target, as are the backers who fund them, the image shapers who make them palatable, the media pundits who dissect their every word, and the gullible voters who lap it all up at face value. his election year timing couldn’t be better — he helps us laugh so that we don’t cry.